LAS VEGAS – Capturing a photo on your smartphone and sharing it with friends is the easy part. But what about turning those shots into printed works of art? Joining the throngs of mobile photo printing services is SnapBox, which offers an easy way to get your photos off your phone and onto your wall. The end result is a unique gallery-wrapped photo mounted on a canvas frame. To order a print, simply send up to five photos attached in an e-mail to snapbox@snapboxez.com. A few minutes later, you'll receive an e-mail with a mock-up of what your SnapBox print will look like. 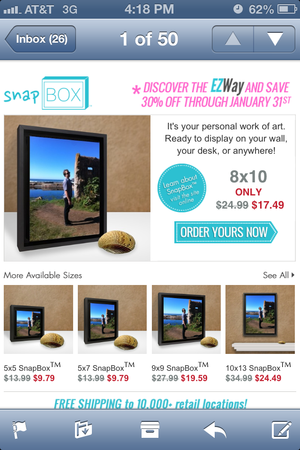 SnapBox offers five size options: 5-by-7, 8-by-10, 10-by-13, and 5-by-5 or 9-by-9 for square shots (read: Instagram). These size options are pre-selected based on photo aspect ratios to keep your photo looking its best. Once you select the size you want, the e-mail redirects you to SnapBox?s website to complete the order. Prints can be shipped directly to your door for an additional shipping fee, or can instead be shipped to your local CVS drugstore for free pickup. SnapBox has also partnered with Seattle-based Bartell Drugs for in-store pickup as well. Instead of going the app route, SnapBox maintains a responsive Web design that works well on the mobile platform. SnapBox officially launched in October by parent company Jondo-USA, but is on display at the International CES in Las Vegas this week. Jondo specializes in high-quality photo printing and art reproductions for galleries, and the company uses the same techniques to produce SnapBox's prints. The shots are printed with a black boarder, and the canvas is stretched over a wooden frame. Prints are UV-protected as well. While there are no photo editing tools offered through the mobile ordering system, you can spruce up your photos on SnapBox's website. Users can create a SnapBox account, upload photos there, and then use the available photo editing tools and filters before ordering a print. According to director of marketing Jenny Coulston, SnapBox plans to offer white canvases as an option for future prints, and Jondo is continuing to improve its mobile Web design for easy ordering. "Our focus is on simplicity, and we want to maintain that without asking our customers to download an app first," Coulston said. 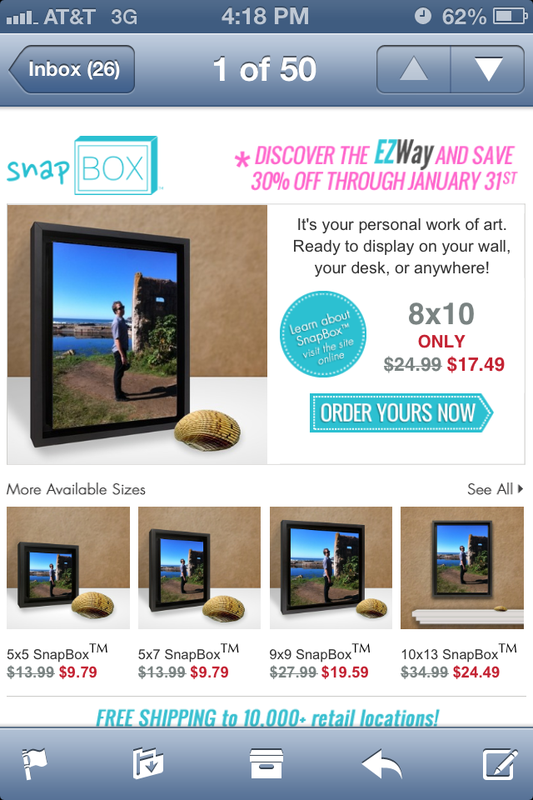 SnapBox prints start at $10 for a 5-by-5 print and go up to $25 for a 10-by-13 print.